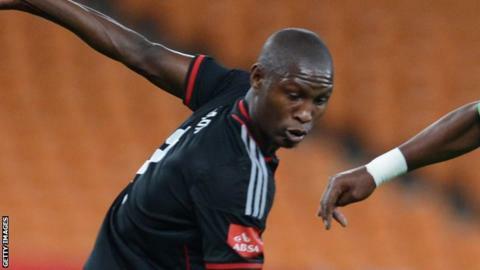 Orlando Pirates defender Ayanda Gcaba was called up to replace injured team-mate Patrick Phungwayo for South Africa's 2015 Africa Cup of Nations squad on Sunday. The South Africa Football Association (Safa) said Gcaba would undergo a medical and organise his travel details before joining up with his compatriots at their training camp in Libreville, Gabon on Tuesday. Phungwayo returned home to South Africa on Saturday night after undergoing an MRI scan on his injured knee. South Africa coach, Ephraim Shakes Mashaba, was disappointed for Phungwayo but positive about Gcaba's inclusion. "It is very unfortunate that we lost Phungwayo but such is life. I would like to thank his club for releasing him to help our cause. We are looking forward to working with him again in future," the Bafana Bafana coach said in a South Africa FA statement. "And to the new player we say welcome, we look forward to you joining us and working here in Gabon. "We know like every player this is a chance you have been waiting for and hope you make a success of it. "I have always said that players should be ready for a call-up and he has shown his readiness. Once again thanks to the club for the full cooperation shown in dealing with this matter, we really appreciate the support given to the national team," Mashaba added. Bafana Bafana are in the same group as Algeria, Ghana and Senegal at the AFCON 2015 tournament. Thulani Serero was left out of South Africa's 23-man squad. The 24-year-old Ajax midfielder was one of four players cut from Shakes Mashaba's provisional selection for the 17 January to 8 February finals in Equatorial Guinea. But Bournemouth forward Tokelo Rantie did make the final list. Rantie, who has scored twice in the English Championship this season, is expected to be one of the team's key players, along with Doncaster midfielder Dean Furman, Andile Jali and Eric Mathoho. And Kaizer Chiefs striker Bernard Parker was back in the squad for the first time since March when he played in the 5-0 defeat by Brazil. His 23 goals in 68 internationals put him third on the country's all-time scoring list behind Benni McCarthy and Shaun Bartlett. Elsewhere, SuperSport United midfielder Thuso Phala and Chippa United midfielder Thamsanqa Sangweni were surprise inclusions in the squad.